Gary Brennan and Tim Ryan, North Dublin School of Music. They detail the D.A.A. sponsored Sword’s Young Musician of the year award and speak of the positive affect it has on the community. Stephanie Regan is a retired airhostess and trainer with Air Lingus, Stephanie details her recollections of the early years working at and flying from Dublin. Ciaran Grant is an Inspector with Dublin Airport Police and gives us an insight into not only the role of the airport police but also his own love for his job. 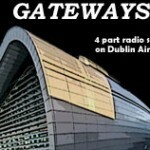 As one of Irelands leading aviation blogger and a former airport worker Trevor Buckley talks us through the recent developments in aviation and the affect of these on Dublin Airport.Linda Murphy is a Revenue Officer dog handler at Dublin Airport and outlines the unusual role of custom’s sniffer dogs.